Hi everyone. The EURUSD touched its 20-day FLD on Tuesday … an alert which went out on Twitter. Are you finding the Twitter alerts useful? The same alerts will be going out on Facebook starting from next week, and while testing that process I realized that the important thing is understanding the significance of the alert, rather than simply seeing the chart. Did you expect support here? And if you expected a target, where would that target be? Yes, the twitter alerts are very useful, especially for a market that one may not necessarily be tracking at that time. Your Facebook quiz however did not show up, at least on my Facebook. If we could continue a EUR/USD thread here, that would be great, as I don’t believe there is currently one out there. Sadly I missed seeing this post last week. I trade EURUSD, and I was expecting weak support, because of the previous price consolidation, the base of which provided the springboard for the recent high. I also expected the bounce off that support, although I expected it sooner, and weaker than what occurred. I expected price to resume its downtrend through the channel before the end of the week and that hasn’t yet occurred. I am still short, for now. Using my traditional channel technical analysis I have a price target of 1.0700 (just above the significant December trough) to be reached on or around May 21. However my (amateurish) initial cyclic model points to a low in June. Overall the EURUSD is in an uptrend with a cycle peak predicted for end of October. I intended to find time to do my (first real/rigorous) phasing analysis of EURUSD this weekend that I will post here if I’m able. Hi Dale, glad you find the alerts useful. I’m a bit of a troglodyte when it comes to social media and should have known better than to go off and post to Facebook on my own. The quiz wasn’t really a quiz at all, but a post on our Facebook page. And so if you search in Facebook for @sentienttrader you should see it there. In terms of a target that was actually a trick question. I realize that you have used other methods of calculating a target which is completely valid. I was wanting to highlight a subtlety of FLD interactions - Hurst generated a target using the level of the cross of the median price and the FLD, and at the time of the alert, whereas price had crossed the FLD, the median price of the daily bar had not, and so you cannot yet calculate a target (on the basis of price crossing the FLD). This often causes confusion because in the FLD trading strategy we initially use that price crossing level to generate an “expected” target, but the actual target can only be calculated when we have a median price cross. Hi David, when things don’t work quite as forecasted, I like to step back at least two larger cycle periods to see the status of the sum of the cycles. Here you show one complete 5 week cycle (50 days), and the progression of a second, off a 10 week cycle (99 days) low. So I assume that the early Jan low, a new all time low for the EURUSD was a synchronized low of at least the 5,10, and 20 week cycles. Keeping the analysis to the timeframe of a 20 week (23 weeks) cycle, your analysis shows the next cycle low due in June, with this 20 week cycle 18 weeks along. 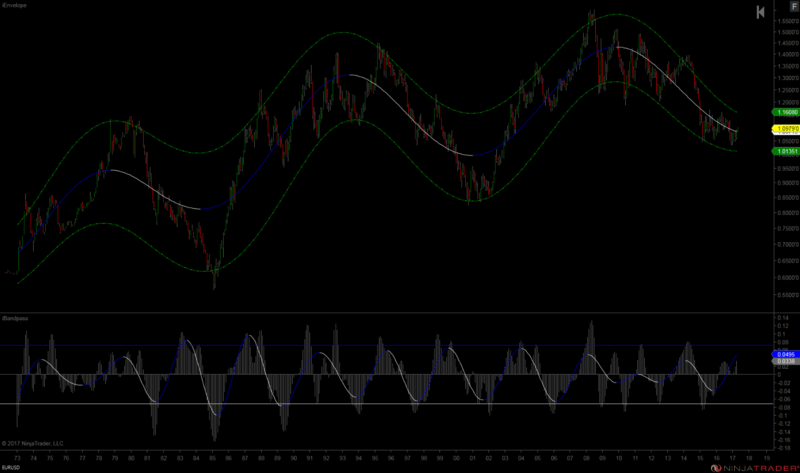 Given the EURUSD is this late in the 20 week cycle, a right translated cycle I might add, weakness or a pause is likely. The other noteworthy aspect of the EURUSD is trying to phase it correctly. Is the April low actually a 10 week low (as shown), a higher low versus the March low, and 14 weeks off the Jan low? So phasing is a bit tricky and would temper my conviction. 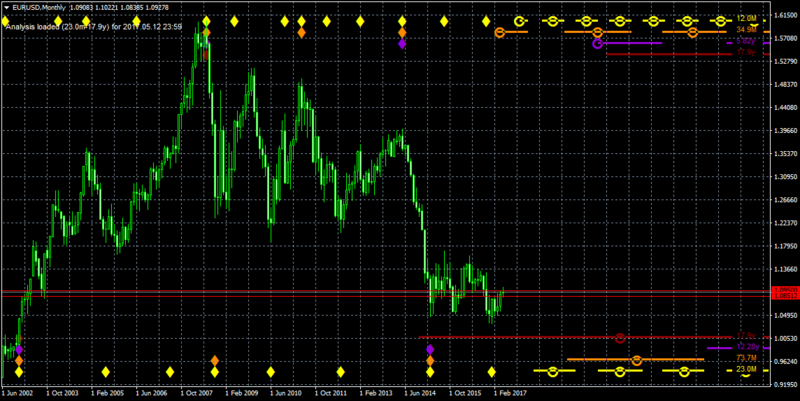 This is the MT4 Hurst Cycles Indicators EUR/USD monthly analysis. I am not sure of much in the EUR/USD, but I am pretty sure the nominal 9-year cycle (trough analysis) is not running at 12.28 years. Any thoughts? Dale, I think phasing the EURUSD trough to trough is easier than the peak to peak. Look at my recent USD Index analysis. The peaks analysis there and the phasing shown is what I would expect to find. And this should ideally match the EURUSD trough analysis. The EURUSD chart is very difficult to phase due to its pattern. I don’t routinely run the EURUSD, so I struggle with it myself. Look at commonality clues in GBPUSD and AUDUSD etc to resolve the phasing issues. What makes the EUR/Dollar more challenging to phase in my opinion is that the dominant waves do not exhibit a simple harmonic relationship over long runs of data. Forex in general is subject to a increased amount of modulation due to its base currency / quote currency structure. The problem can be ameliorated somewhat by using shorter runs of data which highlight a particular dominant wave. 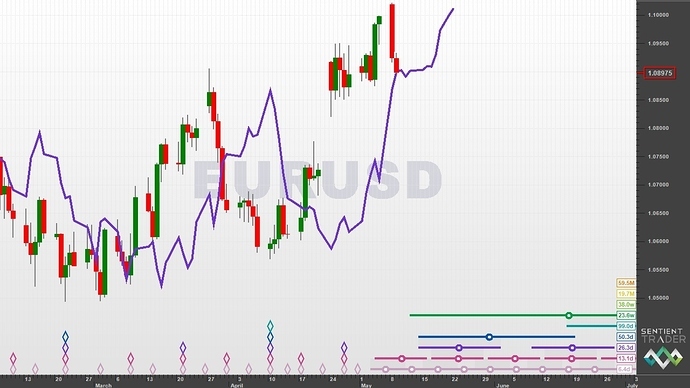 What is confusing me about applying your USD Index analysis (peak) to the EURUSD is that your relationship between the 54 month cycle (46.5 mo) and the 18 month cycle (23.5 mo) is 2-1 ratio rather than the 3-1 ratio of the standard nominal model. A big hello to everyone. First post here. The difficulty in using the same phasing over the long term in the euro has intrigued me as well. I think it’s fair to say that given how the euro came into existance in Jan. 1999, and all previous data are in essence an aproximation of the currency when it did not actrually exist, it makes sense to examine the two periods (pre and after 1999) seperately. I find it very interesting that the pre 1999 era workes very well with a 4 year phasing and the after 1999 with nearly 5years.That works well in both cases for peaks and troughs. And given the large counterparty role of the euro vs the usd, this longer phasing in the euro post-1999, is the one thing that gives me pause when i am faced with John’s call since winter for a longer term top in the dollar. Under this ~5year phasing in the euro, a 10y&20y trough is still ahead at the end of this decade. Dale, I am essentially using the gold model as the nominal model for the $USD Index. Right or wrong, these two instruments have very similar characteristics over time. And it also implies that gold is much like a currency. Great to see you here navyblue! The pattern is repeated only as based on 1992 18 year peak center point. So I have modified the current 18 year peak center point. Same pattern repeating. Again and again. Current trough maybe is 54 month trough. Eurusd looks like 18 month peak. Hi Dale, it looks like you have a “left edge” problem where the indicator is positioning troughs on the left that aren’t as strong as the indicator thinks. It might seem counter-intuitive but sometimes showing the indicator less data makes for a better analysis. Thanks for all the comments everyone, it is great to have discussions going! I agree that the EURUSD is tricky in terms of the longer term picture. My way of handling that is to not bother too much about it and work out my level of confidence … which is at the 80-day level at the moment. Not everyone’s style I know! 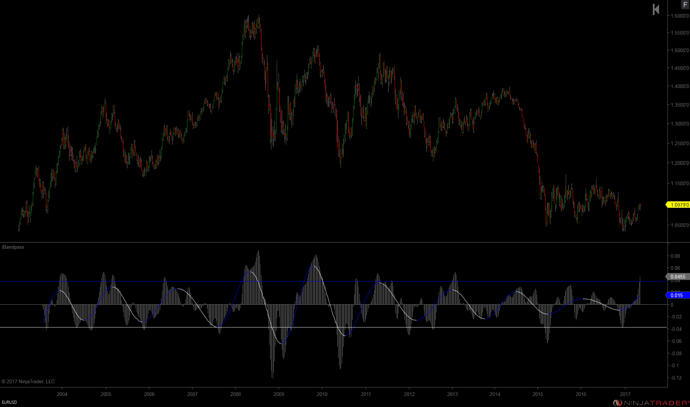 Below is a monthly chart of the EURUSD showing the 4 year wave. There was a large decrease in the amplitude of that wave from the 2008 high to the 2014 high which resulted in a contraction of the wave period. It is too early to tell if that amplitude diminution is permanent or temporary. Also below is a weekly chart showing the 80 week wave. The most recent oscillation is slightly longer than the average period of the wave over the past few years. These are just two examples of the modulation effect to which I was referring. This phenomena continues down to the daily wave level. Thanks, your point is clear although a bit different than mine. Your filter approach is more empirical; you just take what the market gives you, without presuppositions about the magnitude of a paricular turn (or trying to fit one in your assumptions). Curious: has your experience with the filter given you any empirical knowledge of the outcome of a reduced amplitude? A bandpass filter is similar to a Bollinger (not just visually); a very narrow Bollinger width is followed by a power move.Does that apply in your work? The reduced amplitude of a bandpass filter output tells me a couple of things. Firstly, that particular wave has a reduced impact on the overall market movement and secondly the period of the wave is modulated. The next shorter wave usually becomes the dominant wave. The charts above are a good example. When the amplitude of 4 year wave dropped off, the amplitude of the 80 week wave picked up the slack. It is the dominancy envelope above that is similar to a Bollinger band not the bandpass filter. Your question is right on point. The calculation is slightly different but the principle and the interpretation is the same. Contracting bands are an indication that the amplitude of all the waves inside the envelope is decreasing (a “sqeeze”). This is always followed by a rapid expansion of the amplitude. The price action will break out of the envelope in the direction of a long wave that is changing directions. That is what makes the current situation so intriguing. You can see the envelope bands narrowing but the bounce out of the low has been very muted. The price action has continued to put in lower 80 week lows, let alone break out through the top of the envelope. Your other observation is also very astute, I just take what the market gives me! Thanks a lot William. I was watching your charts for a while yesterday and i did not pick up on the importance of the shorter wave when the higher’s amplitude is decreased. Apparently it’s a “thing”. I do agree a lower 20 month cycle here, was just weak as is the the simple series of lower lows and highs. A break of your envelope becomes easier on the downside in such a situation. We’ll see.